We bring ease, accuracy and accountability to flooring, portfolios and asset management with our on-line floor management applications. Our success has been built on a solid foundation. QuestMark serves our local customers across North America with a commitment to professionalism. We remain at the forefront of modern flooring technologies. We provide a comprehensive Safety & Risk Program that ensures a safe work environment with on-going training, state-of-the-art and equipment. QuestMark will analyize your floors to determine the needs, usage, budget and level of impact and abuse. 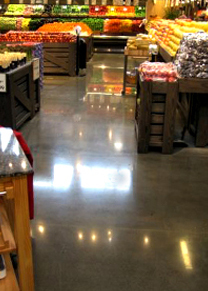 Our experts will propose customized floor system options and repair recommendations. QuestMark's Safety Program is driven by the best in class training programs conducted daily, weekly, monthly and quarterly. Providing costomers with flooring work on their facility in a safe manner. Accurately scheduling a project is critical to reducing disruptions to your business and employees. We have years of time management experience. Let us prove our expertise to you! After a project is completed, QuestMark professionals will educate our customers on proper floor care as well as providing maintaince programs and repair products. We have you covered.